Worldwide, the number of climate-related disasters has more than tripled since 1980, per National Geographic. How can those of us living in small spaces be best prepared? Housing supplies for an evacuation or shut-in can be pretty tough to do in limited square-footage. Water, food, survival gear, and hygiene goods add up to be pretty bulky. Plus, the realities of an emergency situation require us to bend some of our basic Small Space Living rules— such as not owning duplicates. As a basic example: if you already have a flashlight in your toolbox or junk drawer, you should still probably have another in your emergency kit. If you need to evacuate your home within minutes (or seconds), you'll not have the time or ability to reach scattered, miscellaneous supplies around your home. 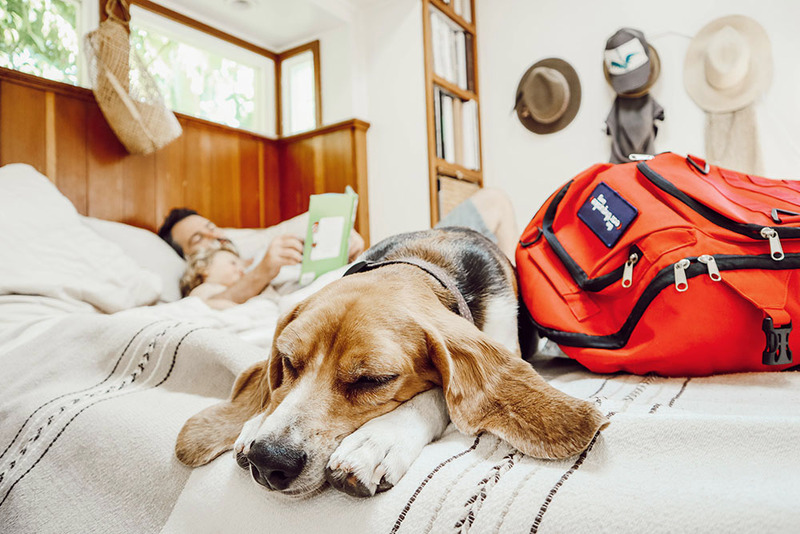 Given the realities of our tiny house, I appreciate that The Earthquake Bag’s contents can be customized to fit our family— including pets— eliminating the guesswork and minimizes excess. Many of the supplies in the kits are wrapped in plastic, which we normally try to avoid. But this is one of the great ways to actually use plastic— items need to be preserved over time, and protected from elements such as water and ash. For 3 people and 2 dogs, we got a 1-person Complete Bag (for 3-days), a 2-person Complete Bag (for 3-days), and a 2-Dog Bag. This division of items over 2 smaller backpack breaks up the weight between the adults and make it easier to separate supplies if necessary. These bags are thus easier to accommodate in our home, on our cargo bike, in our car, and/or carry on our backs. We keep our 3 backpacks lined up under our bed, but they could just as easily be stored via hooks above a door, or high up on the unused upper walls of a closet. Wherever you keep yours, make sure they're easy to access in a moment's notice. I chatted with Skyler Hallgren, co-founder of The Earthquake Bag, and posed some questions specific to our tiny space, as well as a few questions regarding general emergency preparedness. 2) Decide that when "the Big One" hits everyone will die, so there is no reason to think about it. Truly, the vast majority will survive our next major earthquake without serious injury. It's just statistics! The important thing is to think clearly about the risks your particular location must deal with, and take the high-leverage, common-sense steps to make sure you can thrive, even if infrastructure and services are down for a few days... or even a few weeks. Our message is always the same - don't freak out! Earthquakes and other natural disasters don't need to be fear-inducing. But we can be smart enough to put some thought into it beforehand, and make sure our families are prepared. And then go on living our lives in this beautiful place! Whitney: We have soft back books above our bed due to a built-in bookshelf and limited storage space. (Thankfully, they’d land on our torsos rather than our heads if they tumbled out.) But on this topic: do you have any safety tips or advice for folks in earthquake zones who have loose or bulky home accessories (lamps, plants, books, etc.) stored above or immediately next to their beds? Skyler: Yes - move them! If they are small enough to secure, then start there. If it's a wall hanging, have them secured directly to the wall. We use Quake Hold on anything smaller in our homes.. it's an extremely tacky putty that keeps wall hanging and decor items in place during shaking. If it's something that is too big to secure, and is close to the bed or a window, it's got to be moved to a safer location. Whitney: What precautions should one take with their gas lines immediately after an earthquake? Skyler: First off, any one living here with gas lines in their home needs to have a gas shutoff tool zip-tied to the valve. It's so easy to do, and can absolutely save your home from the most common way homes are destroyed in an earthquake - fire. They are inexpensive and are so common sense. Why ziptied? Because you want to eliminate any work you need to do after emergency, like searching your home (even a tiny home!) for your gas shutoff tool. Make it easy on your self. You only want to turn it off if you smell rotten eggs. The gas company adds a chemical to natural gas to give it a smell you can distinguish. If you smell rotten eggs, turn off the gas. If you don't, leave it alone, as you would need the utility company to turn it back on again. Whitney: If residents have to evacuate due to a disaster scenario, how should they prep their home/apartment itself before they leave? Skyler: Hopefully you've already compiled all the essentials in your emergency kit. Not only food, water, first aid and other essentials, but personal items that are sure to be important. Think cash, copies of ID and insurance, an old pair of sneakers and jacket, written-down contact info, contacts, extra glasses, prescription medication, spare keys, and maybe even a map. Once you have all that, and if you have a few extra minutes, find your circuit breaker panel and set the main circuit switch to off. The most important thing? When you get the notice to evacuate, don't waste time. Put yourself in a situation to be able to be out the door with all the essentials in under 30 seconds. You don't have time to waste. Sincerest thanks to Skyler and the team at The Earthquake Bag for your time and input for this post. Explore their Frequently Asked Questions about their products and emergencies here. And for anyone interested in learning more about The Earthquake Bag's Disaster Relief Program, click here.